The world of whipped cream dispensers can get very confusing, with so many to choose from and so many options available, half pints, pints and quarts, what does it all mean? And what one is right for me and my needs? There are many questions associated with choosing the right whip cream dispenser. We have layed out all of ISI whipped cream dispensers and the benefits over each one, some are better for commercial use, others are better for home use. But the truth is they all serve (for the most part) the same purpose. We hope this outline will help you better understand which ISI whip cream dispenser is right for you. There are three different size ISI whipped cream dispensers available – Half pint, 1 Pint and 1 quart. * Remember you make 2 to 6 times more whipped cream using a whipped cream dispenser. The ISI Easy Whip dispenser comes in White and Brushed Aluminum colors and sizes are half pint and 1 pint ONLY. All Easy Whips are built with molded plastic heads and a unique push button dispenser mechanism. Specifically designed for the home user with a nice presentation in mind, this is not suitable for a commercial application. The Easy Whip includes a standard factory 2 year warranty from iSi. The Easy whip replaced the ISI dessert whip for the main home use dispenser. Great functionality, great design. This is the top-of-the-line stainless steel iSi Cream Profi Model 2416 whip cream dispenser. Stainless steel body, AND now featuring a stainless steel head and solid metal charger holder, this is simply the best model iSi produces. Includes a full 2 year warranty from iSi. The Profi Whip is the same model used by most Starbucks™ world wide. In our view, one huge advantage is that the head valve is removable, therefore easier to clean and less expensive to maintain. Different then the Gourmet whip this does not come with a silicone gasket, meaning, you can not use it for hot items. If you want to use this dispenser for hot items you can purchase a silicone gasket here. Comes in 1 pint and 1 quart sizes ONLY, comes will a full 2 year warranty with ISI. Although it’s made for commercial use, it is also a very popular dispenser for home use. We strongly recommend this whipped cream dispenser. Similar to the Cream Profi, this is the iSi Gourmet Whip, designed for both hot and cold foods. Stainless steel body, this is the new generation stainless steel head and body with silicone griped charger holder, silicone gasket and 3 decorator tips. Solid dispenser and very durable. Comes in 1 pint and 1 Quart ONLY. The Gourmet Whip includes a standard 2 year warranty from iSi. The ISI Thermo Whip Plus 100% Stainless Steel (Head and Body) Dispenser is the first whip cream dispenser with thermal capabilities. 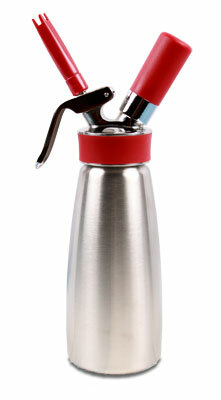 The Thermo Whip keeps contents cold for up to eight hours with no refrigeration needed. It also keeps ingredients hot, without the need to reheat for up to three hours. This is without a doubt the newest and most sophisticated whip cream and hot food dispenser available. Comes in 1 pint, the 1 quart size is called the Thermo Whip Express. Comes with a full 2 year warranty with ISI. I am trying to figure out which size dispenser to purchase. I am a home chef who will be using the dispenser to experiment & prepare recipes for family & friends. I was planning on getting a Pint sizes iSi Gourmet dispenser. I like the idea that I only havge to use 1 charge for that model. However, I plan to make recipes out of my Modern Cuisine at Home book & all of those recipes are for a Liter size. I have never used a whip cream dispenser before & don’t know if I can just half those recipes in order to make them in the Pint size. Please help! Also, is the iSi Profi the same as the iSi Gourmet, only without the gasket? mean that 2 cups of cream are produced by the dispenser or that the dispenser can hold 2 cups UNWHIPPED whipping cream? I’m guessing it is the latter, but I wanted to make sure. Would 2 cups be the MAXIMUM capacity of a pint sized dispenser? I would suggest a 1 US pint (0.5 L) dispenser for home use. Most commercial and home use kitchens don’t use a 1 Liter or 1 Quart dispenser, because it’s too large and bulky, and a 1 US pint is manageable. For example all Starbucks use the 1 US Pint Profi. Both the Gourmet and the Profi are great dispensers, the only negative about the Gourmet dispenser is that the head valve( the main functioning part of the dispenser) is not replaceable, where in the Profi it is. This means in the Gourmet, you can’t clean the head valve to save the life of it or replace it in a few years when or if it goes faulty. With the Gourmet you would have to either buy a new head piece at a min cost of $45 or a new dispenser — a head valve costs $5.50. The reason why the Gourmet is sold as a dispenser for both hot or cold items is because it comes with a silicone gasket, where the profi comes with a rubber gasket. For the best value, I would suggest a 1 US pint Profi and purchase a gourmet head gasket and when you use it for hot items you can put in the silicone gasket, or just replace it with it indefinitely. So to make whipped cream in the dispenser you would first put in 2 cups of regular whipping cream, then charge with 1 N20 charger. The 1 Pint dispenser produces 2 to 4x the amount of whipped cream once charged with N20. Yes, the maximum you can put into a dispenser is 2 cups. What is the estimated yield of whip cream with the ISI Cream Profi Whip? We just got a new 1L profile and have made a few sodas in it, Sven though it doesn’t list it as being a function of it. We have found about 1 cup of fruit juice to 3 cups of water works and tastes great. Lots of fizz and flavor. I wish the Profile came with SS decorative tops and a cap for where the gas goes in. After reading your informative blog – paying special attention to the valve issue – I’m left with one question. Why would iSi go out of its way to advertise the new ‘one piece head’? Your arguments about the replaceable head valve makes perfect sense to me, but I’m wondering if there is a plus side to the new design. If it was just about cheaper production or what have you, they wouldn’t advertise it, right? Maybe I’m over thinking this, but I’d like to know all the pros and cons before I decide. If I use the 1L model but put half litre of whip cream, do I still need to use 2 chargers? If I use the ISI Profi Whip 1L model but only making 1/2L cream in it, do I still have to use 2 chargers? Or 1 charger is enough? I just ordered a iSi Gourmet Whip and I sure would love to hear some feedback about Inigo”s question above? Sadly, I didn’t see this information until after I already ordered. I was lamenting about whether to get the Profi or the Gourmet Whip and ultimately I want to be able to do both hot and cold items so I chose the Gourmet. If the only difference were to be a rubber or a silicone gasket I would have certainly just got the Profi Whip with the changeable and cleanable parts. Is there something superior to the new design or are they trying to sell new heads every couple of years?? Not sure what isi’s plans are. But the only difference between the Gourmet and the Profi is the Gourmet has a silicone gasket, allowing you to use it for hot and cold items. This part can be purchased separately and works with the profi as well, making it work for hot and cold items too. Thank you for the info. That is sad because I already ordered the Gourmet Whip after searching high and low for one that is not red. Obviously I also would rather have the Proifi Whip because you can change the valve when it becomes faulty whereas with the Gourmet you have to replace the entire head.. I am wondering if I can refuse the package and reorder what I truly want? The defining difference is that you need to use two chargers when you use the quart (liter) sized units. Most of the time, I make smaller amounts so the quart unit would waste chargers. I had a thought — haven’t tried this but am sure it would work. Measure out large glass marbles or stainless steel ball bearings to displace a pint of water (that is, add them to a pint of water until the fluid reaches the quart line). Use these marbles/bearings in the unit and your quart whipper is now effectively a pint! I bought a pint (1/2 l) unit so can’t try this but bet it would work. Can I use this to whip butter? Even if it’s not a milk-based butter like whipping olive oil, almond, or coconut oil to get a whipped butter consistency? 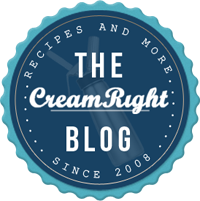 I had a all-white ISI whipped creamer for years and years and years and absolutely love it! Finally played out, and I am seeking a new whipped creamer. I ordered one off Amazon, and after the first use I returned it. ( different brand). My ISI container was all white, I measured 12 ounces of whipping cream & 4 tbls powdered sugar and it worked beautifully for many years. I am confused as to want to order to replace it. I can only find stainless models, and I’m concerned the stainless will get scratched up and show wear, when my white one looked brand new all the time. Can you help me decide which model order, and where to order? I’m regards to Moe Rubenzahl’s statement on using glass marbles or stainless steel ball bearings to displace the space in a quart ISI gourmet whip to make it seem like you’re using a pint container? Has anyone tried this out and has it proved effective? I’m looking into investing in a gourmet or thermo whip canister and I’m trying to decide what to get either the pint or quart whipper. I’m personally leaning towards the quart one as I’d have a lot of uses for it. However, I’m looking to save on the cartridges needed to fuel the whipper. Again, has anyone tested Mr. Rubenzahl’s idea to displace the space with glass marbles/stainless steel ball bearings to compinsate on the space to use 1 no2 charge vs. 2 no2 charges? How can starbucks POSSIBLY use the US pint charger since the US pint 473 ml and the Starbucks recipe card for making whipped cream is to use 475 ml heavy whipping cream AND 8 pumps of syrup which is another 82.8 ml totalling 557.8 ML …the only way starbucks could use a pint dispenser is if it was an imperial pint which is 568 ML, which would be perfect. Your site, however, clearly states over and over US PINT. Either stop referring to Starbucks using YOUR pint, or get the facts straight.